When I started my testing career, I used to think that what my company followed was THE process to follow. To be honest, I had no idea of why would someone even deviate from THE process. Then, I went to a meetup and there were questions. Those questions led me to more questions and my journey of learning began aggressively. I started hunting for those answers which led to more questions and the cycle has helped me grow as a person. Then I went to a conference. I was blown away by the problems faced by people. I was silently happy that I was not alone who was facing such problems. I hesitated first but seeing others discuss, I also jumped in and asked questions. To my surprise, the speakers responded happily! And they are now my good friends. Imagine a good meet-up which usually lasts half a day with ~10 participants. Now, think of an event where participants from 20-30 meet-ups come under a single roof for 2-3 days. That's what is a conference. There will be people who have just joined the industry, veterans of the industry, some who are facing problems and want solutions, some who have tried few approaches and some others who have eliminated that problem long back. You will also meet people whom you might have seen online as an avatar(their twitter/blog/Skype id). If you think you can arrange for a quick chat with so many professionals without attending a conference, good luck! I have never presented in any conference. There is a first time for everything. 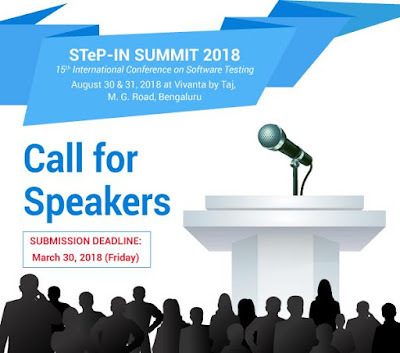 This could definitely be your first conference as a speaker. I am not an expert in any topic. What will I present on? No one is an expert. The more one learns, the more they get to know how less they know about the subject. So, jump in and present about your perspective of the topic. Everyone is unique and many will benefit from your experience. I was rejected last time when I applied. Why should I try this time? You were not rejected. Your proposal did not fit in the final scheme of things. Imagine - on a given day only 11 players can represent a team. You will get your chance soon if you are really good. You should never stop trying. Even after being an invited speaker for many conferences, my proposals get rejected. That doesn't stop me from trying. What topics should I present on? Understand the theme, relate it to your experience, learning, problems, experiments and create a good proposal beneficial to your friends. Neither be too specific nor too generic. There are definitely reviewers who will help you if you let them know that you need help in polishing your topic. I want to learn. I don't want to present. Can I attend? Of course, you can. What better place and mindset to be in than be a active learner. There is no pressure of preparing for the talk. Though you might miss out on the excitement of presenting, interacting with the larger audience about your topic, you can learn by listening to others too! The cost is too high for me. Should I...You must be joking. Did you see that it is roughly 5k if you register before Feb 28th. "If you want to double your income, triple your learning" and if you don't invest in your learning, then don't cry when your income doesn't increase. I attended one conference before. It was not by STeP-IN but it was also a conference and there were only sales pitches. How is this different? Good that you asked this question. You know what? I will be honest with you. There will be some sales pitches here as well. But the quality of the overall conference and the content of the speakers will outweigh one sales session. How much do you get paid for this blog post?Zero money, lots of love. Ok, I am now convinced. Where should I register? Ajay, I want to take it one step ahead! I want to present. What will be my next step? See you in the conference then.